IMPORTANT NOTICE JULY 2017: OptionsHouse is now a part of E*TRADE. 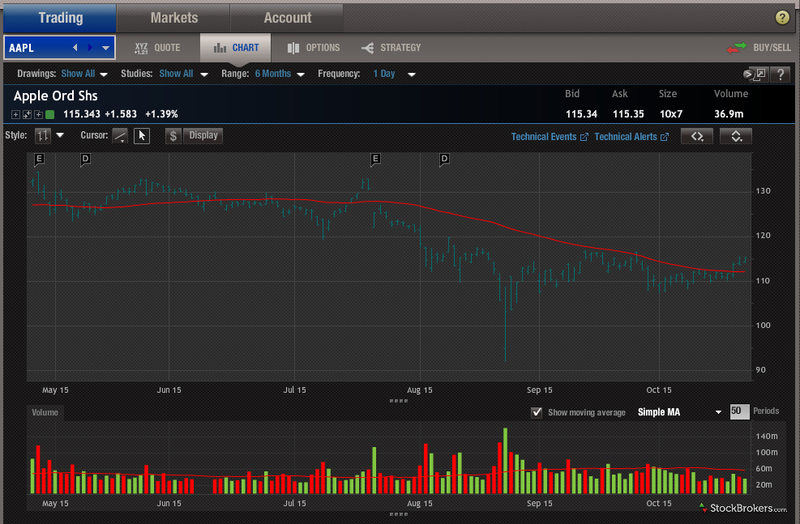 Please read our E*TRADE Review for a full breakdown of the combined brokerage. OptionsHouse has come a long way. 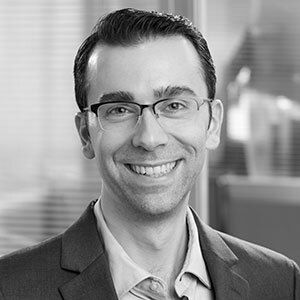 After its establishment in 2005, the online broker grew until May 2014 when it was announced the company and tradeMONSTER would be coming together under one roof. OptionsHouse was best known for its highly competitive commission rates, while tradeMONSTER was known for its terrific web-based options trading platform. From 2014 until the summer of 2016, the combined OptionsHouse brand thrived, ultimately being purchased by ETRADE for $725 million. At the time this review went to press in February 2017, OptionsHouse continued to run as a stand-alone entity and brand, doing what it has always done best, providing clients fantastic options tools with highly competitive commissions. Stock trades are a flat rate of $4.95 per trade and options trades are just $4.95 + $.50 per contract. This flat-rate commission structure is significantly less expensive than those of all the large, full-service brokers, such as TD Ameritrade, Charles Schwab, and Fidelity. What we also deeply appreciate is that OptionsHouse’s structure is clean cut, with little or no gimmicks or special-case scenarios that can ramp up costs in a hurry. In fact, when you break these rates down against the entire industry, OptionsHouse finishes No. 2 overall behind Interactive Brokers. For equities and options traders this is a seriously competitive commission structure that cannot be overlooked. What we also deeply appreciate is that OptionsHouse’s structure is clean cut, with little or no gimmicks or special-case scenarios that can ramp up costs in a hurry. No platform fees or data fees either – the rates are all inclusive. To provide its active options trading customers with an even better deal, OptionsHouse kicked off 2016 by implementing a new Dime Buyback program, under which the company removed commission charges tied to closing short options contracts of $.10 or less, no matter what the spread type is. For example, if a customer makes a two-legged options trade and one leg was a buyback for $.10 or less, the second leg commission would be reduced to $0. OptionsHouse competes with the best in the industry when it comes to powerful platforms for trading options. Built as a web-based platform, OptionsHouse innovates and delivers speed, quality, ease of use, and the tools needed for options traders to succeed. For newer investors, there isn't a better platform on which to learn how to trade options. OptionsHouse offers both virtual trading and regular trading. For newer investors, there isn't a better platform on which to learn how to trade options. Pulling up quotes is a breeze, and OptionsHouse makes it easy to file personal notes with each trade. Regarding OptionsHouse’s streaming charts, the functionality is good but there are drawbacks. First, the interface is not user-friendly and, compared to other brokers, it took us significantly longer to become acquainted with making customizations. Second, there are limited tools (just nine) with which to mark up charts. Third, there is a lack of technical studies available – only 35, compared to the industry average, which is close to 100. This extends to study customizations, which we also found to be limited. On the plus side, you can place limit orders on the chart itself, then access a pre-filled order ticket to review and submit the trade. 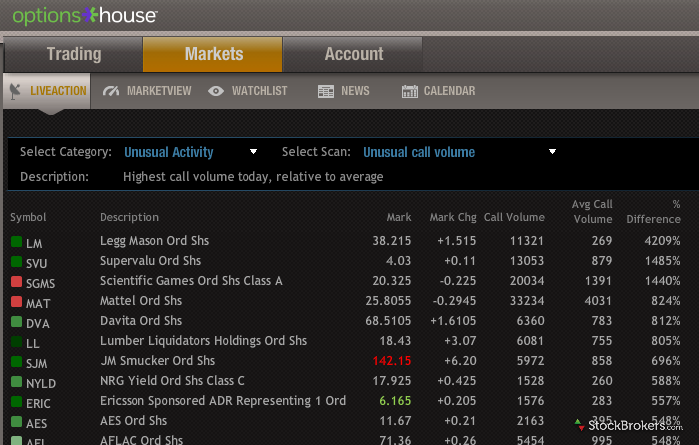 OptionsHouse also allows you to view your past buys and sells right on the chart, a feature few other brokers offer. 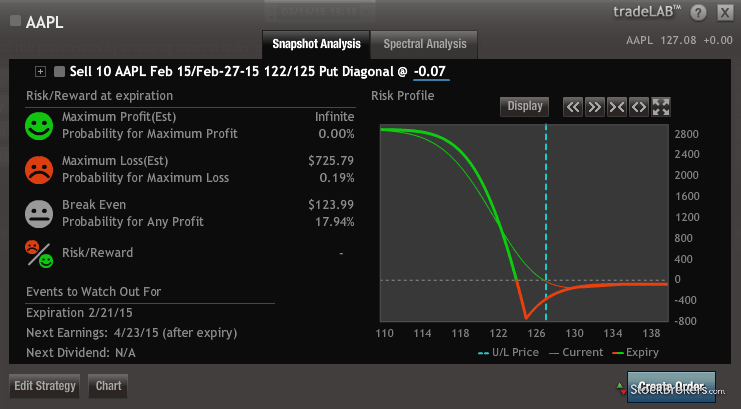 Moving onto options capabilities, OptionsHouse shines. The option chain screen displays a fully customizable streaming real time option chain with 30 different optional columns, including every greek. Once you find an option of interest, clicking it pops open OptionsHouse’s summary window, which includes key metrics alongside different quick links for further analysis. 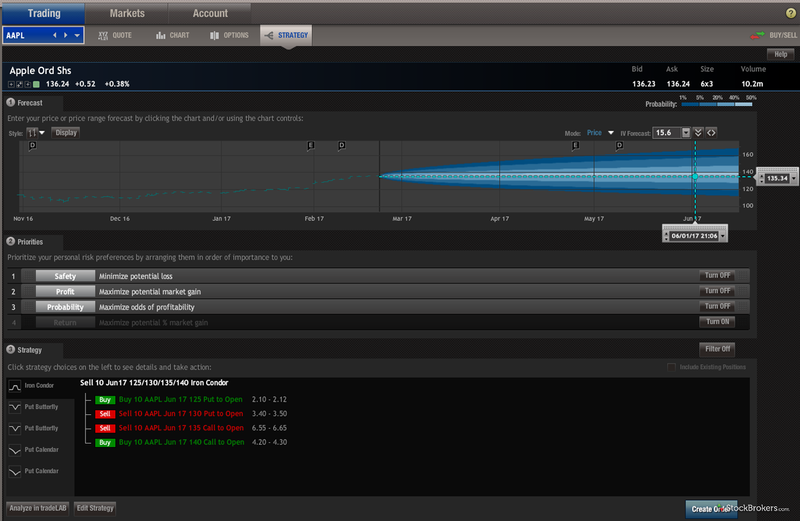 Click Analyze and the tradeLAB Snapshot Analysis pops open. Not only is Risk/Reward completely broken down with simple smiley faces to translate the pros and cons, but key events to watch out for are displayed alongside a P&L chart. It’s a work of art. If that isn’t good enough, OptionsHouse then provides a Spectral Analysis, which includes all the data needed to make an informed decision. My favorite feature on this tab is Risk Metrics, which displays the option greeks. Since not all investors understand greeks, OptionsHouse has a simple pull-down menu to change from "Greek" to "English," making the data user-friendly for new investors. Awesome. 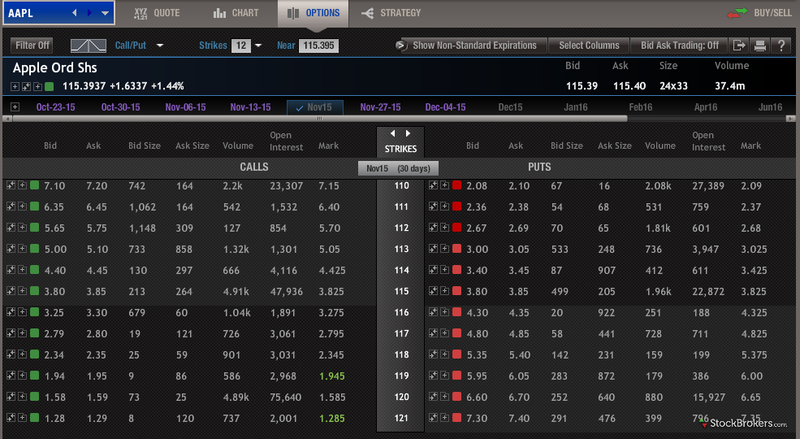 Even with all these capabilities, the highlight for options remains the strategySEEK tool, which is where you will find the platform’s option screener. 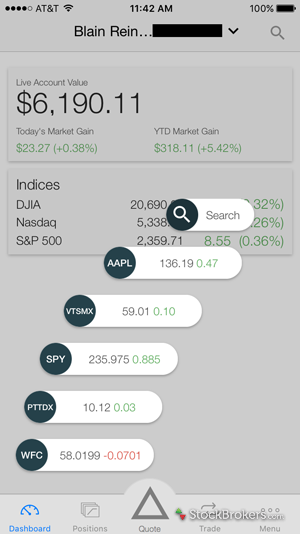 strategySEEK is hands down the best options scanner in the industry. Even with all these capabilities, the highlight for options remains the strategySEEK tool, which is where you will find the platform’s option screener. strategySEEK is hands down the best options scanner in the industry. First, you forecast the price at which you think the stock might end up down the road. Next, you drag and drop to set and order your priorities for the trade: Profit, Return, Probability, and Safety. Lastly, you click “Show Strategies” for a list of the best possible matches. From here, you can create an order and place the trade, analyze the trade (see above), or adjust the scanner and rerun. It isn’t just the interface that makes strategySEEK impressive, it’s also the data and behind-the- scenes calculations taking place to power the tool’s recommendations. The OptionsHouse platform calculates EVERY possibility, millions of them, using a plethora of data, and displays results in milliseconds. This attention to detail is also seen throughout the rest of the platform in tools such as the liveACTION scanner. All in all, the arsenal of tools available to options traders is truly impressive. OptionsHouse has a clear understanding of what options traders want, and delivers it in stunning fashion. And, as far as equities trading goes, while the platform has a strong foundation of functionality, the overall trading experience could be better. This is especially true for the charting interface, which needs an overhaul. That said, when it comes to browser-based platforms, options trading, and ease of use for new investors, OptionsHouse is king. On the right sidebar of the Quote screen is OptionsHouse’s take on stock research, which is a breakdown of company information and fundamentals. OptionsHouse offers its own Fundamental Report Cards for each company, which, until October 2015, also included letter-relative ratings. While I applaud the OptionsHouse platform team for thinking outside the box, I found the data difficult to interpret and unimpressive. With such competitive commissions, OptionsHouse must cut somewhere, and research is where the broker shaves cost. Beyond the Fundamental Report Cards, not much else is offered. There are no third-party research reports, no way of conducting metric comparisons against other companies, no SEC filings, and you cannot even view a simple balance sheet. With such competitive commissions, OptionsHouse must cut somewhere, and research is where the broker shaves cost. Similarly for ETFs and Mutual Funds research, the experience is poor. The data is very limiting and the only real positive is being able to see a Morningstar star rating for both ETFs and mutual funds. OptionsHouse is not recommended for research-hungry investors. In late 2016, OptionsHouse released a brand-new mobile experience, completely rebuilt from the ground up. In prior years, OptionsHouse’s mobile apps suffered in the speed department because of their HTML 5 core. Thankfully, speed is no longer a worry and the broker now has a fantastic foundation to build from. Looking at the features of the new experience, on the plus side, the app has the strong core functionality traders desire: real-time streaming quotes, excellent position management capabilities, and synced watch lists. 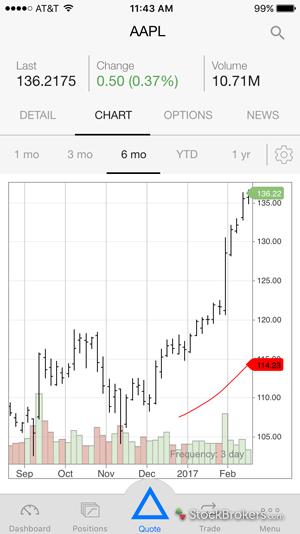 The app also enables traders to place basic and complex options orders, view post-hours charts, and more. OptionsHouse also ties in some creative design elements, such as a fanning out the five most recent quotes when you tap on “Quote” on the bottom bar. On the cons side, the app is still so new there are features missing that are still under development and awaiting release later in 2017. When looking at stock charts and trying to perform technical analysis, you cannot rotate the screen horizontally to view the chart cleanly. Studies are fairly limited at 11 (although they can be deeply customized, which is nice) and there are no tools beyond pinching to zoom in and out. OptionsHouse has left its previous app in the app store for this reason, which makes sense. All data considered, while OptionsHouse clients are stuck using two separate app experiences until the new app is fully featured, the mobile offering is still great. OptionsHouse placed fourth out of 16 brokers. OptionsHouse delivers customer service that is on par with industry standards. The broker is certainly not industry leading, finishing eighth overall, but it delivers a quality experience that should appease most clients. Also not covered in my review commentary is OptionsHouse’s educational resources. While these resources improved in 2016 with the addition of webinars and more educational content on the company’s blog, OptionsHouse still lacks across the board. Education is limited to just options, there are no videos, organization is poor, and there is a lot left to be desired. OptionsHouse has proved to be a terrific home for options traders over the years. There was no better confirmation of OptionsHouse’s dominance than the firm’s acquisition by ETRADE for $750 million in July 2016. For now, OptionsHouse remains a stand-alone brand that continues to do what it does best. While it is weak in its offering of education, research, and tools catering to active stock traders specifically, OptionsHouse is on par with the industry with its customer service and shines everywhere else. For options trading, OptionsHouse is No 1, thanks to its discounted pricing structure and industry-leading tools. Select one or more of these brokers to compare against OptionsHouse. *OptionsHouse was not included in the latest annual review, as a result this data may not be up to date.